HM Babatunde Fashola SAN, in a meeting with the Disco Board Nomineess for the Pre-Inauguration meeting at the FMPWH Conference Room, HQ, Mabushi, Abuja. 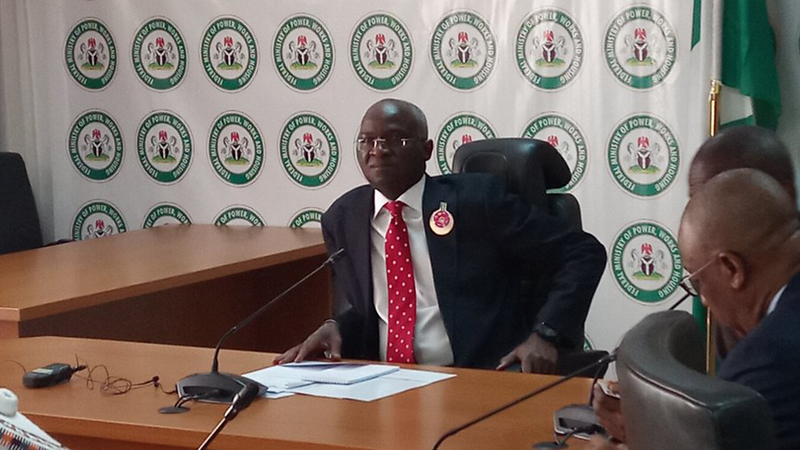 Minister of works, power and housing, Babatunde Fashola, on Friday, gave a glowing endorsement of the governorship candidate of the All Progressives Congress (APC) in Lagos State, Babajide Sanwo-Olu. The former governor, also a member of the ruling APC called Sanwo-Olu the “most competent” person to govern Lagos state among the candidates jostling for the top seat of the state. Fashola was speaking at an event in Surulere where a coalition of 53 political parties adopted the candidacy of President Muhammadu Buhari and Sanwo-Olu as their presidential and governorship candidates. The minister spoke of Sanwo-Olu’s efficiency and excellence when the APC candidate was a commissioner under Fashola to emphasise that he was fit to lead the state. Hailing the decision of the parties to support President Buhari’s re-election bid, Fashola said Lagos residents had no choice than to return APC to power. Fashola took potshots at major opposition party, Peoples Democratic Party (PDP), stating that in its 16 years of ruling Nigeria before Buhari took over they left infrastructure in Lagos to rot. He continued that the opposition party’s presidential candidate, Atiku Abubakar, had no plan for the country. Fashola in his criticism of the opposition described the policy paper of PDP presidential candidate as impracticable. He said Atiku’s plan is a “strategy of lies”. Conversely, Fashola said Buhari’s investment in infrastructural renewal was unprecedented, adding that the “Next Level” slogan of the APC was strategically coined in preparation for the projected job creation and economic upswing that would come as dividends of Buhari’s investment in infrastructure. The Lagos APC governorship candidate, Sanwo-Olu, said Buhari’s achievements in four years could not be compared to PDP’s 16 years in power, saying the APC-led Federal Government had initiated and completed 143 road projects across the nation since 2015. According to a communiqué issued by the coalition and signed by its convener, Hon. Akinola Obadia, the APC-led Federal Government had done more projects in Lagos to consolidate the status of the state as the fastest growing economy in Africa.